MPI honorary chairman Hii Ching Chiong (third left) presents a memento to Hii while William (second right), MPI acting principal Hii King Kai (right) and MPI CEO Judy Wong look on. 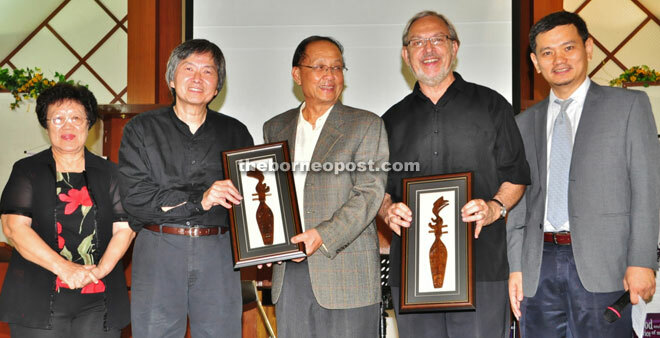 SIBU: A classical music concert featuring world class guitarist Philip Hii and professor of clarinet and saxophone William Lipman was held at Wei Kuok Hall, Methodist Pilley Institute (MPI) here recently. It was sponsored by Del Mar College in Corpus Christi, Texas. Hii has performed in the United States, Mexico, Germany and New Zealand. His Bach CD received rave reviews from critics in Germany, England, Japan and the United States. The Washington Post calls the CD ‘exciting’ and ‘dazzling’ and Acoustic Guitar Magazine calls him ‘the Hiefetz of classical guitar’. Hii was born in Kanowit and brought up in Sibu. He started playing the guitar at the age of 10. After winning a national competition in Malaysia, he left for New Zealand to study law. Philip won the New Zealand National Cup and appeared on national television. He furthered his studies in England and Germany before going to the United States in 1983. Hii holds a Bachelor of Music degree from Victoria University of Wellington, New Zealand and jazz diploma from Berklee College of Music and a Master of Music Degree from the University of North Texas. He has published numerous articles in Soundboard, Guitar International, Gitarre und Laute, and American String Teacher (AST) and is a former guitar forum editor for the AST. Six of his Bach transcriptions have been published by Guitar Solo Publications. Hii’s second CD, ‘Stream of Consciousness’, is a compilation of originals arranged for solo guitar and synthesizers. In 2004, he released his third CD, a compilation of 11 Chopin nocturnes transcribed for guitar. Hii was a member of the New York City Classical Guitar Society Artistic Advisory Board. His most recent project is a series of books called ‘The Art of Virtuosity’. William Lipman meanwhile received his Bachelor of Music degree from Boston Conservatory of Music and his Master of Music and doctoral studies at the Eastman School of Music. William was the principal clarinet of the Eastman Wind Ensemble and the Eastman Musica Nova and has served as principal clarinet with the Jerusalem Symphony Orchestra and Co-Principal Clarinet and the Cape Town (South Africa) Symphony. He has been a soloist with the above orchestras as well as the Boston Pops Orchestra in Symphony Hall. As a clarinetist and saxophonist, he has performed with a variety of orchestras that include the Rochester Philharmonic, Schubert Theatre in Boston, Boston Pops Orchestra under the direction of Arthur Fiedler; and in venues throughout the United States, Canada, Europe and the Middle East including Carnegie Hall, Lincoln Center, Mann Auditorium in Tel Aviv and the Concertgebouw in Amsterdam. William is an active guest artiste, adjudicator and Master Class pedagogue with presentations and workshops including in Boston, Berklee College of Music, Texas – MENC, San Antonio and UIL in Austin and at Rimsky Korsakov Special School of the Performing Arts Music High School of St Petersburg Conservatory, St Petersburg Russia and Tel Aviv University’s Music Department in Tel Aviv, Israel. In October 2014, he conducted the Performance Master Class at the Central School of the Moscow Conservatory of Music. William has a body of works commissioned for him by composers as Sydney Hodkinson, Warren Benson, Dennis Leclaire, Joseph Bardarnashvilli (Ukraine/Israel) David Krivitsky (Moscow) and WO Smith from the David Brubeck Quartet. He is presently professor of clarinet & saxophone at Del Mar College, Texas, USA and a member of the performing artistes of the Bacco e Bach Festival in Monferrato, Italy.